Oh, the places you can go when you read! So, I just got back from the Swat Valley in Pakistan, and I was there from 2009 to 2012. While in Pakistan, I experienced what happened when the Taliban started to terrorize the people. Most of the Taliban toughest sanctions were against women. One of the sanctions that really disturbed a little girl named Malala was the band on girls going to school. 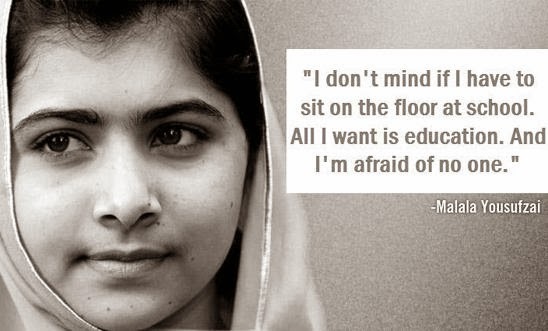 Many women in Pakistan are uneducated; however, Malala's father wanted her and other children to get an education. So, he opened a school. She published her journals and also allowed herself to be filmed in order to show how difficult it was for her to attend school. My people, this is a story of courage in the face of adversity, and I highly recommend that you read. Sometimes, we must STAND UP and be heard!!! My next read is Instincts by T.D. Jakes; join me!